Are you ready for the warm weather? Well, if you’re not, which I can’t possibly imagine because I’m biting at the bit for the sunshine at this point, then these Lime Cheesecake Shooters are going to get you in the mood. 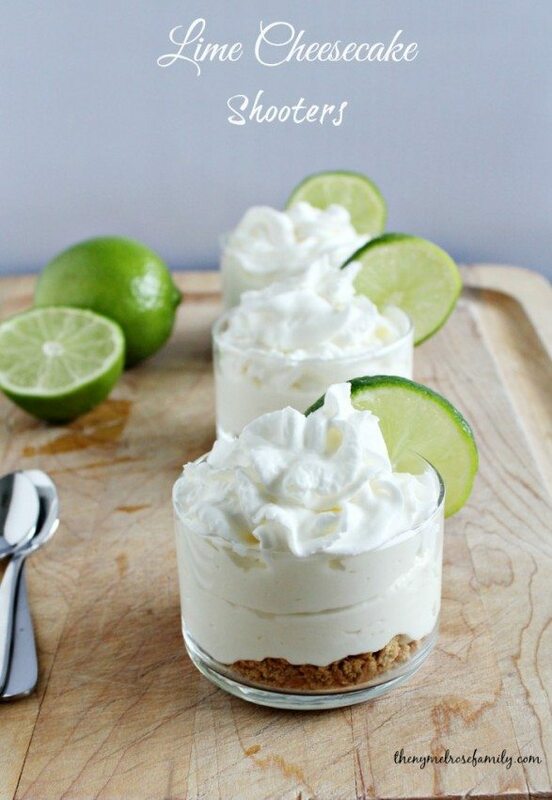 They are the perfect individual serving of lime cheesecake that come together in a snap. The best part is that these babies are no-bake! Lime always makes me think of summer. That’s probably because I’m a huge fan of mojitos and margaritas. I’m sorry, but after the long winters that we have in NY, I’m ready to enjoy a delicious cocktail in the sunshine. 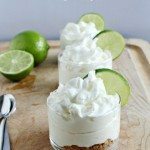 The nice thing about these Lime Cheesecake Shooters is that they are the perfect size to make me feel less guilty and they are the perfect size for my girls. Plus, I love the fact that I get to use my Libbey Just Desserts Mini Bowls. They are the cutest things ever. Can you tell how cute the little spoons are? They make me feel so dainty and they are the perfect size for Avery. 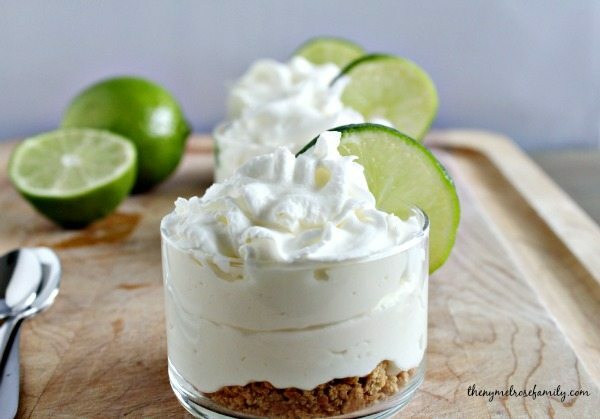 We also have the Libbey Just Desserts Parfait Glasses and they would also work for these lime cheesecake shooters, but I needed a little something more than three bites on this particular weekend. A mama has to do what a mama has to do. 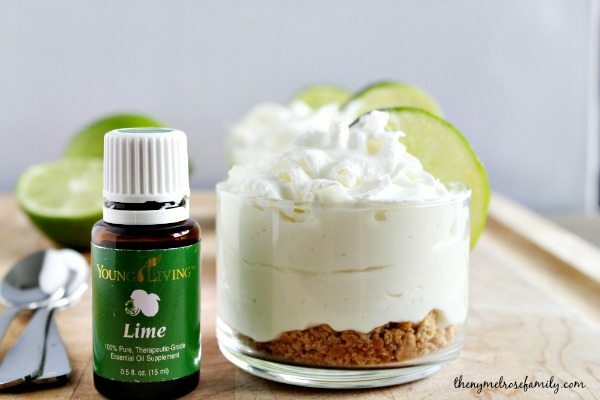 These Lime Cheesecake Shooters are made so much easier because they use Lime Essential Oil. I recently started experimenting with my Young Living Essential Oils in my recipes. I love the fact that it’s quick and easy, but I also love knowing that I’m using an oil that has a seed to seal promise from Young Living. For the month of April we’re running an amazing promotion on our Young Living Oils Premium Starter Kit that you don’t want to miss out on so be sure to check it out HERE. We’ve made Strawberry Lemonade Cake Cookies as well as Lavender Lemonade. You might have noticed that I’ve teamed up with some amazing food bloggers to bring you recipes all using the same oil. Last month’s oil was lemon and this month is obviously lime. We’ll be playing with lavender next month so be sure to grab your starter kit today because lavender is one of the eleven oils included in the kit. Join the 10 DAY CHEMICAL FREEDOM CHALLENGE! 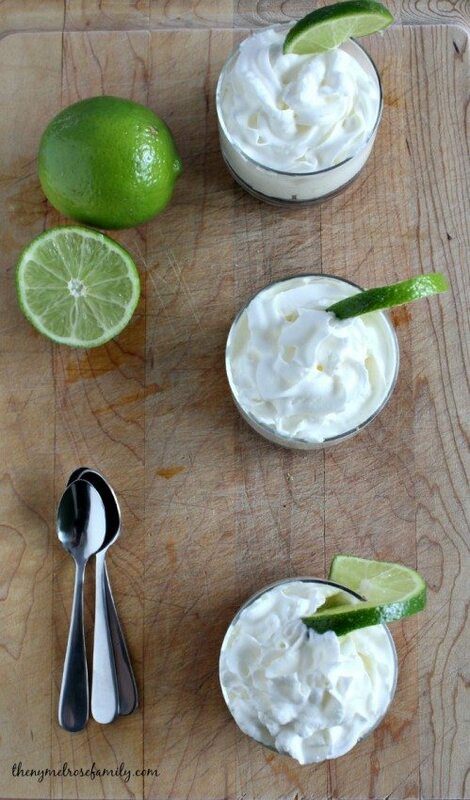 Our Lime Cheesecake Shooters are the perfect simple and easy dessert. Combine the cream cheese, greek yogurt and sugar and blend together. Add in the lime essential oil and lime juice to the cream cheese mixture and combine. Allow the cream cheese mixture to chill in refrigerator for an hour. Add the melted butter to the 6 crushed graham crackers and mix. Layer the graham cracker mix at the bottom of the small bowls. Top each graham cracker layer with the cream cheese layer. Add whipped cream and the lime garnish to each bowl and serve. 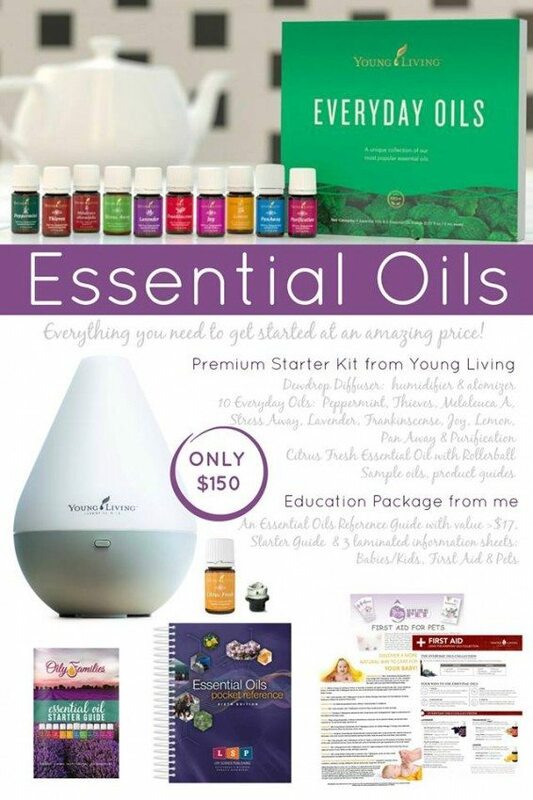 We are completely in love with essential oils and are over the moon excited to be able to offer you our AMAZING March 2015 deal that will get you started! Check out all the details on our essential oils information page. These are the oils we use and love! Thanks so much for this fabulous recipe! Such beautiful photography! Pinning and making this summer for my husband! Thanks so much. You are too sweet! Another no bake cheesecake. This will really save time since there’s no need to heat things up. And I also like limes. It also reminds me of summer maybe because of its color. It will definitely get us in the mood for upcoming warm weather. Would like to try this when we have a work related event. However my job is warehouse work so I would be content to use Dixie cups. How much does this recipe yield as is, please? borrowed from the military messenger bag.